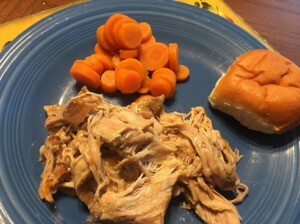 This is almost a 2 ingredient pork roast but I guess you have to count the broth and corn starch. 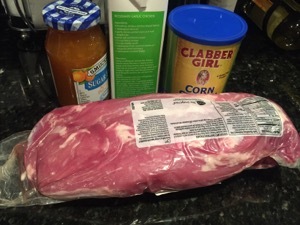 A nice pork loin, a jar of apricot jelly and the aforementioned ingredients. It just falls apart as it is so tender and delicious! Prep Time: 15 min | Cook Time: 360 min | Servings: 6 servings. 1. Place roast in a 3-qt. slow cooker. In a small bowl, combine preserves and broth; pour over roast. Cover and cook on low for 6-8 hours or until tender. Remove meat to a serving platter; keep warm. 2. Skim fat from cooking juices; transfer to a small saucepan. Bring liquid to a boil. Combine cornstarch and water until smooth. Gradually stir into pan. Bring to a boil; cook and stir for 2 minutes or until thickened. Serve with pork. Yield: 6 servings. 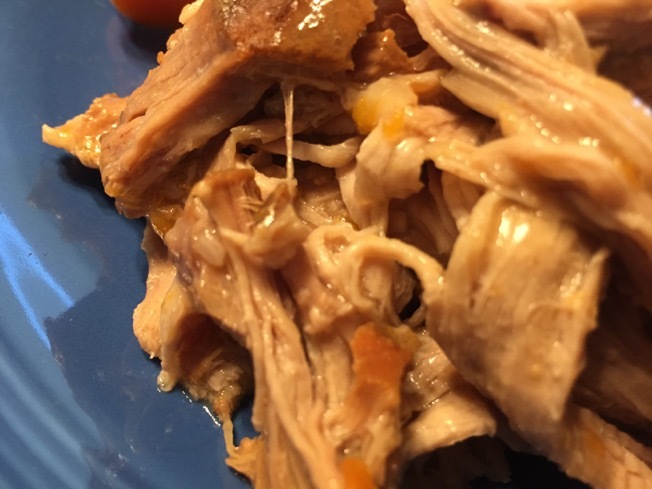 Nutritional Info: 4 ounces cooked pork with 1/3 cup gravy equals 337 calories, 7 g fat (3 g saturated fat), 75 mg cholesterol, 223 mg sodium, 39 g carbohydrate, trace fiber, 30 g protein. Diabetic Exchanges: 4 lean meat, 2 starch. Sounds great and could it be easier?